A shooting last week at Santa Fe High School in Texas is the latest in a string of school shootings this year. The Archdiocese of Chicago and local students are now teaming up to address the problem. 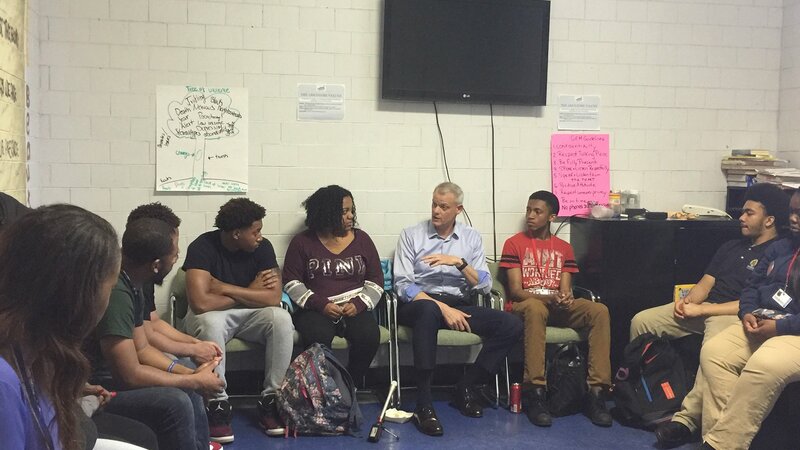 Phil Andrew, who was a gun violence victim of Laurie Dann in 1988, met Wednesday with students from Evanston Township High School for an open discussion about gun violence. The Family Action Network organized the event. Andrew was appointed by Cardinal Blase Cupich in February to lead the Archdiocese of Chicago’s violence prevention program. In his role, Andrew says he’s been listening to people in the community, including providers of mental health services and trauma counselors. He believes the root causes of gun violence, whether in urban or suburban settings, are isolation and division among communities and families. Mollie Hartenstein, 16, is a junior at Evanston Township High School and a Family Action Network fellow. FAN tapped Hartenstein and 15 other high school juniors from various area schools to put together Wednesday’s panel discussion. Trevon Bosley, 19, is a student at Southern Illinois University. He is a member of B.R.A.V.E – Bold Resistance Against Violence Everywhere – based at St. Sabina Church in Chicago. Bosley was personally affected by gun violence at a young age. His brother was shot and killed when Bosley was just 7 years old. Shortly after that he joined the B.R.A.V.E Youth Leaders. Andrew, Hartenstein and Bosley join us for a frank discussion about gun violence.